Spring riding often means rain and cold. Keeping your hands and feet warm is one of the surest ways to help you stay on the bike longer. Enter bootie love. You keep your feet warm with cycling booties (also called shoe covers or overshoes), whose purpose is to hermetically seal your feet from the cold and rain. Booties and cycling shoes ought to go together like love and marriage, but well, they just do not. Like a good marriage (in theory), they do keep you warm and happy, yet booties can be the embodiment of difficult. Snug-fitting, warm cycling booties will help keep you on the bike longer. It seems nearly every manufacturer introduces a new design or three every year in attempts at achieving greater warmth, better water resistance, and wishful thinking around the futile goal of achieving easy entry and exit from the booties. That last one is the problem, and seemingly the aspect to which many experience the greatest difficulty. Some booties will never fit over certain shoes or cleats. My favorite overshoes are made with full Gore-tex (not Windstopper). They do a great job of keeping my feet warm and dry, but unfortunately lack any degree of stretch, making fit over my winter shoes impossible, rendering my favorite booties only marginally useful. For shoes and cleats, I use a Gore-tex lined winter shoe and Time road cleats, for a combination of height and width that clearly no bootie designers had in mind. Why would I use both a Gore-tex shoe and a Gore-tex bootie? Gore-tex lined cycling shoes leak, plain and simple, but adding that second layer of Gore-tex can keep your feet dry. 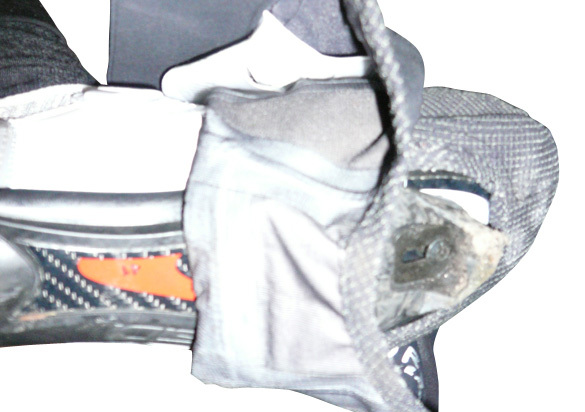 I’ve owned several pairs in multiple brands, and no matter how waterproof they are, they leak during the pedal motion because small gaps open up between your legs and the top of the booties where the water you are rotating with each pedal stroke is coaxed into any infinitesimal gaps that exist at the bootie top, heel, or cleat. Still, Gore-tex lined cycling shoes are much warmer and worth the expense and hassle of finding booties that fit over them. Step 1: Realize that whomever designed your booties did not have your shoes and cleats in mind. This may help eliminate the idea that easy entry is possible, and help you engage a zen approach of sorts. Step 2: Take a deep breath and slow down, because no amount of struggling will get you into your booties faster. Note that you will wind up struggling anyway, for this is the rule of bootie engagement. Step 3: Sit and cross one leg over opposite knee, insert toe of shoe into bootie, then grip the underside of bootie at the back of the cleat hole, and pull back (with all of your might if necessary) until your toe is at the very tip of the shoe cover. If you bought the correct size, you’re going to need the full length of the shoe cover, so pulling it all the way back is important. Step 4: From top, pull bootie up and over shoe closure to top of shoe tongue. Five main areas to pay attention: fit, cleat hole, heel cutout, velcro (or zip) closure, top bootie collar. Step 5: Wiggle and squirm your foot like a hooked fish until cleat hole on bottom of bootie is fully around cleat, such that cleat/pedal engagement is completely possible. You might have a bit of the cleat hole overlapping the back of your cleat. 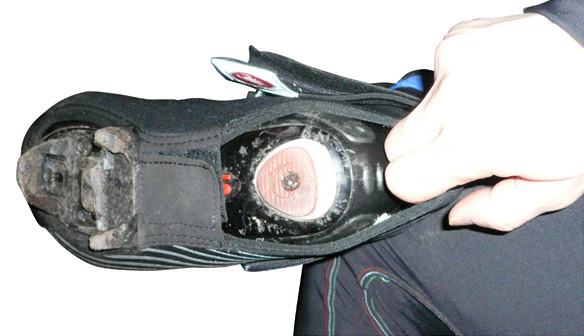 If possible, pull it back off the cleat so you don’t wind up with messy pedal engagement and a prematurely chewed up overshoe. 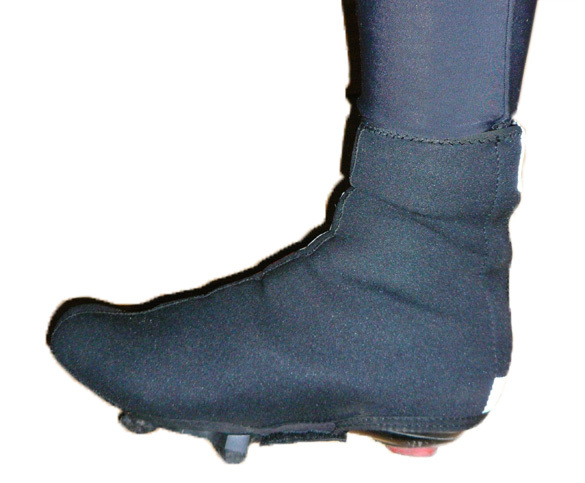 Some bootie designs have a thick velcro strap behind the cleat. Be sure to fasten it as straight as possible and fully behind the cleat so that it does not hinder pedal engagement. Step 6: Now for the tricky and often frustrating part. If your booties have a heel hole, thank your lucky stars, and grip the back of your shoe cover through that hole, then pull back until you can zip, velcro, or otherwise hermetically seal your shoe in the bootie. Step 7A: If you have a velcro closure at the back, make sure your velcro is straight so that you do not step on the tail end of it while stepping on rain, grit, mud, oil, worms, etc. Step 7B: If you have a zipper (usually at back, occasionally on top): grip both sides of the closure and pull back toward your heel as though your life depended on it, then utilizing magic dust, make the two sides stay in place while you conjure a third hand to zip it up. 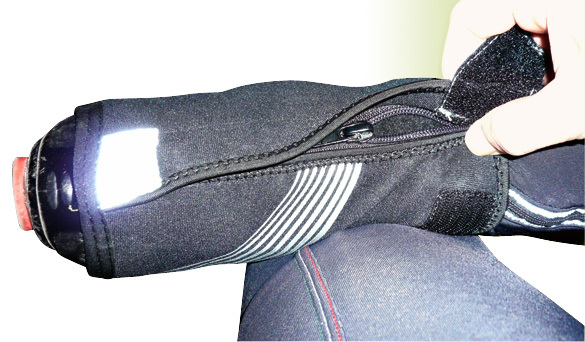 Seal the velcro at the top to help your mostly done-up zipper stay zipped, though you should know that it may not stay as your calf muscles naturally flex. 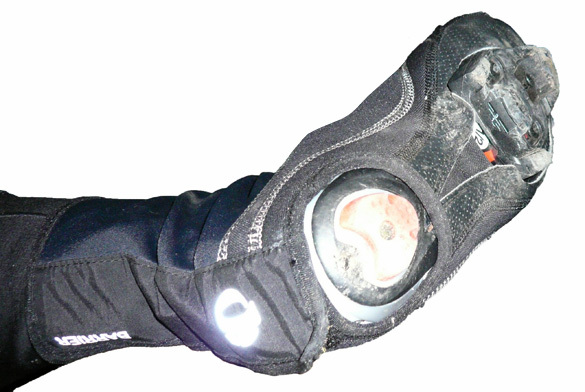 A new third-hand tool for zipping cycling booties would be nice. Step 8: Forget about your booties while enjoying your ride. Love that your feet are toasty warm (and if they are frigidly cold, go home, follow Step 9, and get new booties). Booties lacking stretch can get caught on your cleats. Step 9: Your ride happily completed, sit down, then with the presence of mind of a Hindu hippopotamus, unzip and/or unvelcro, and gently pull bootie away from your body in a sort of herkyjerking motion that will cajole the bootie off your shoe. Sometimes it gets caught under the back end of the cleat. Know that the bootie will think it is part of your body and will fight you with all its might to stay put, such that you may liken it to pulling off your own skin. You can try carefully pulling the shoe cover away from your cleat to help convince it otherwise. Note: Keep industrial scissors handy if you are in a hurry and don’t mind utterly destroying your booties.